There's nothing more powerful than the right song playing at just the right moment. Whether you’re listening to The Strumbellas on a cottage dock, lining up for a KAYTRANADA show in Montreal or dancing to Alessia Cara in your bedroom, music has the ability to move, empower and connect Canadians from coast to coast. 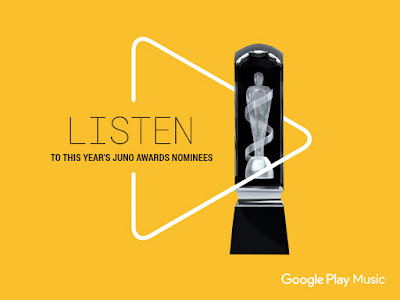 That’s why we’re thrilled that Google Play Music is partnering again with the 2017 JUNO Awards. As Canada celebrates 150 years, we can’t think of a better time to honour our rich and diverse musical history and contributions to the global music stage. To showcase the best music made this side of the border, we created the 2017 JUNO Awards Nominees playlist that features this year’s JUNO-nominated songs, albums and artists. From maple syrup music legends like The Tragically Hip and Céline Dion to hook-heavy fan favourites Drake and The Weeknd to unique breakthrough artists Jazz Cartier and Ruth B, this year’s incredibly talented list of nominees is diverse and inclusive -- just like Canada. Not only do we love to celebrate our homegrown talent, we’re also excited to support the next generation of Canadian musicians. Starting today, when you subscribe to Google Play Music using this link, we’ll donate $1 to MusiCounts. Bonus: You’ll get your first 4 months of listening on us! Celebrating its 20th anniversary this year, MusiCounts is a charitable organization that provides access to music programming and instruments through local schools and communities across Canada. We’re incredibly proud of our homegrown talent making waves around the world and the emerging artists who continue to grow Canada’s incredible music ecosystem. Congratulations to this year’s JUNO Awards nominees! Put on headphones, turn up the volume and get to know their music here before the awards show on Sunday, April 2nd.